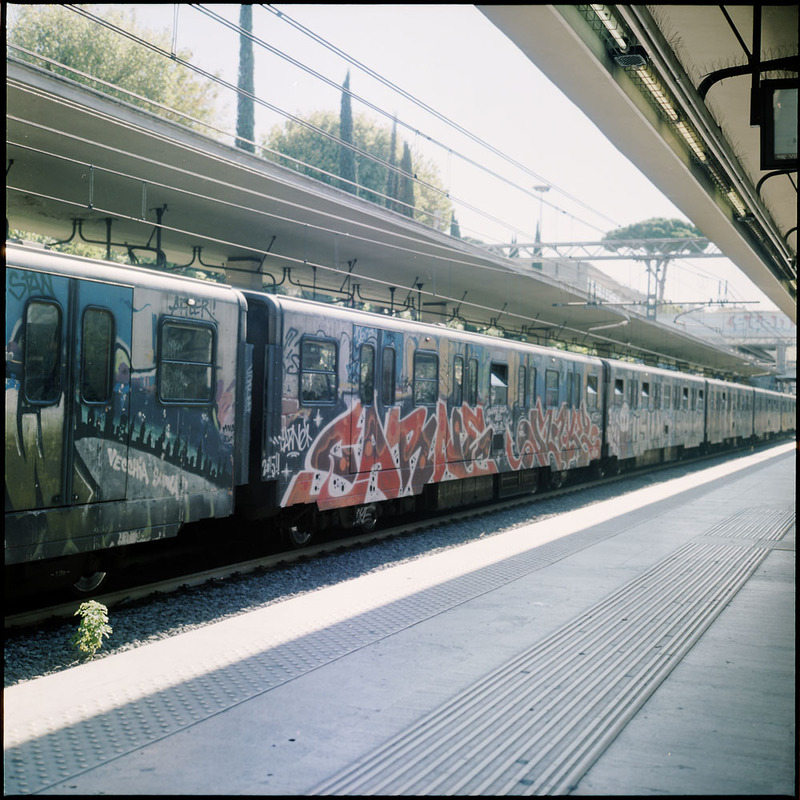 The Roman subway trains are covered in graffiti in a way reminiscent of the New York City subway trains in the 1970s and 80s. 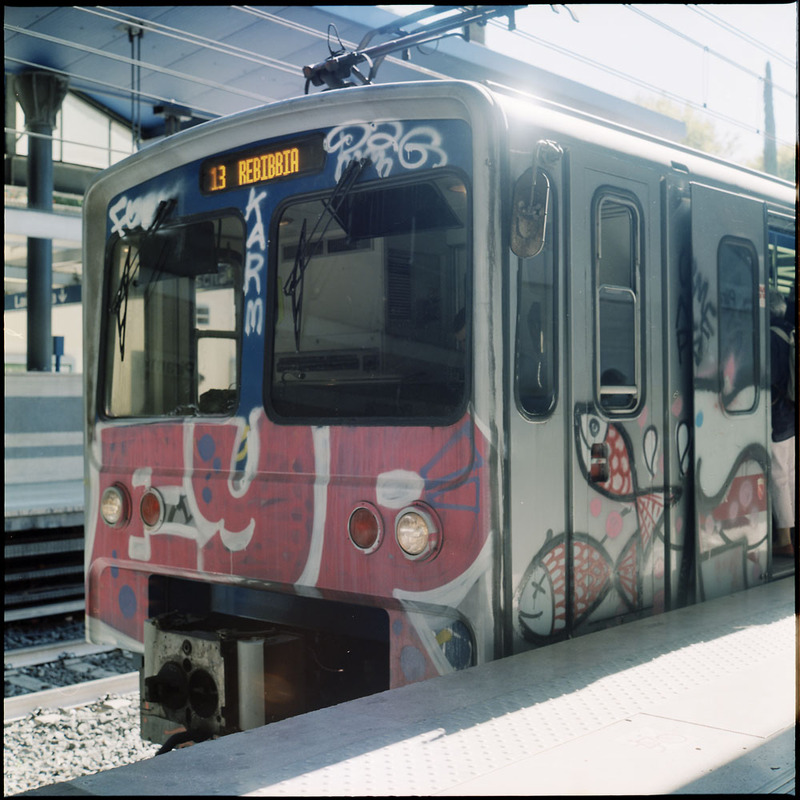 I assume the yards where the trains are parked at night are insecure – that would be the only explanation I can think of for the sheer amount of graffiti. 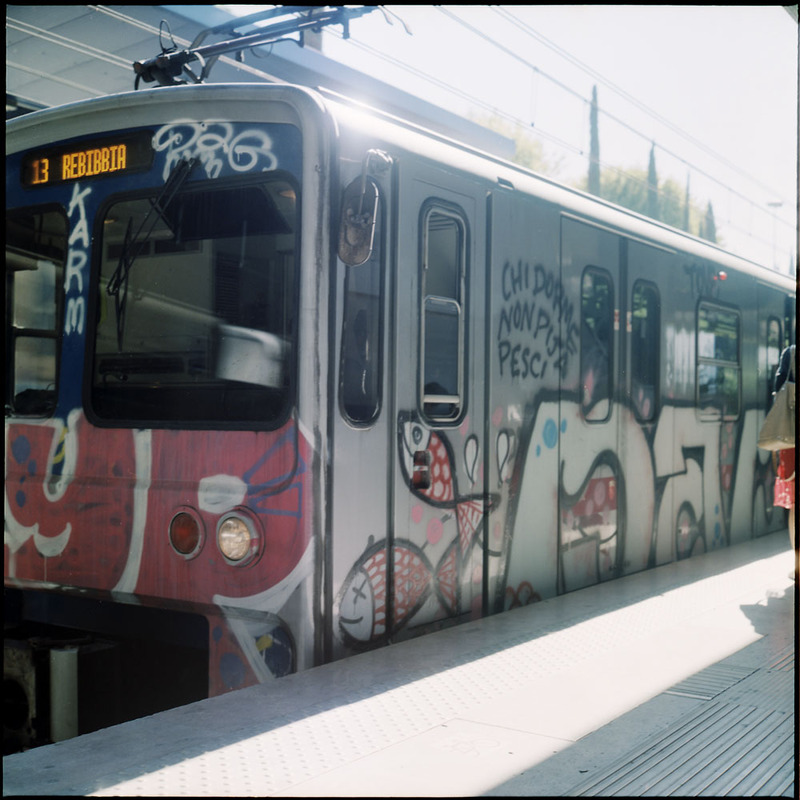 While my memory of New York City subways in the 1970s is a bit vague, my impression is that the graffiti there was not so much artistic as it was mostly tagging by individuals and/or gangs. 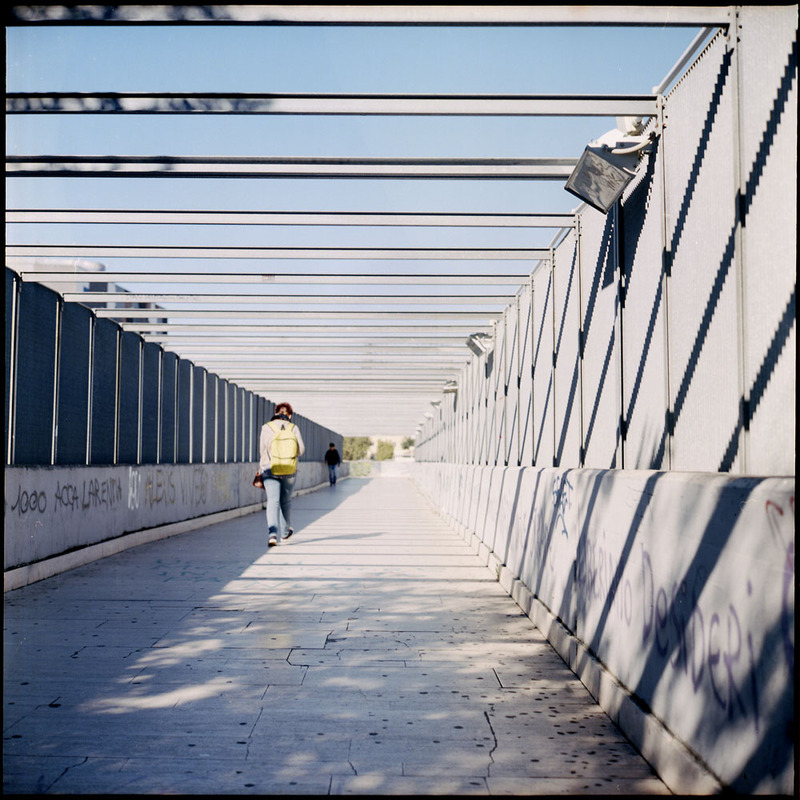 Here, as in seemingly all things Italian, there is an underlying artfulness to at least some of it. And even the text commentary (“Who sleeps not [something] with the fishes”) is relevant to the designs. I don’t know if my misreading of the handwriting is wrong or if the phrase is some Italian/Roman slang phrase that Google Translate can’t figure out. Any readers who understand the expression, please chime in and correct me! 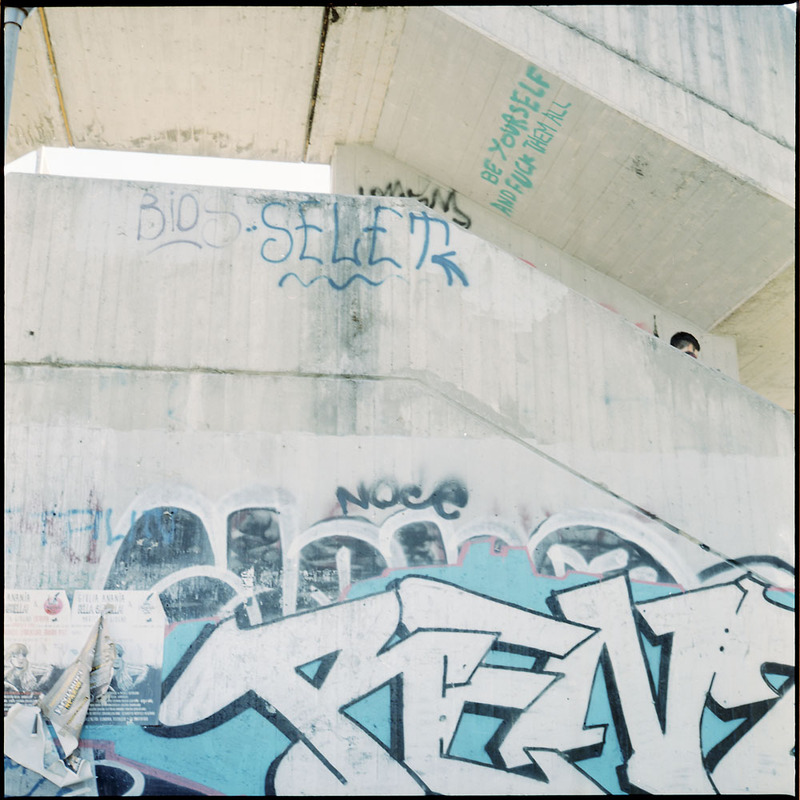 This series is about people, relationships, and graffiti. I’ll leave the interpretations up to you, the viewers. 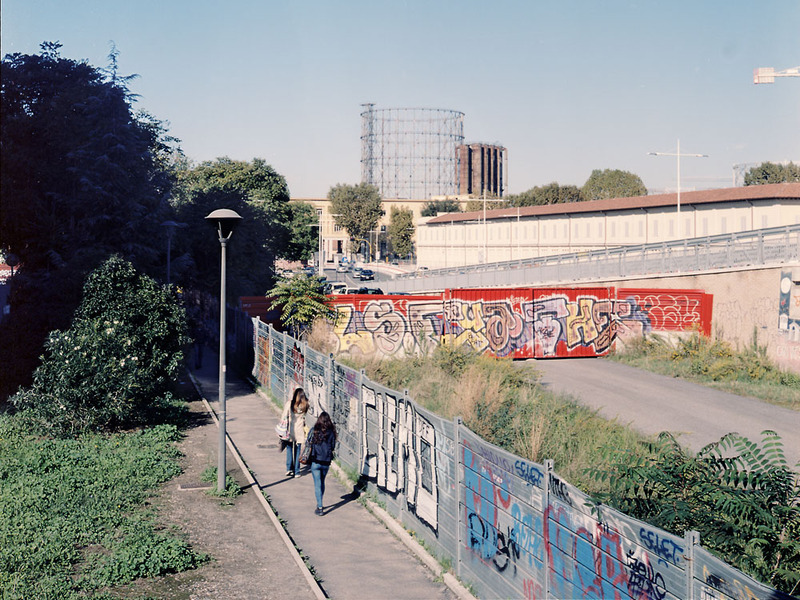 Something I found fascinating was the degree to which English has penetrated into Italian life. 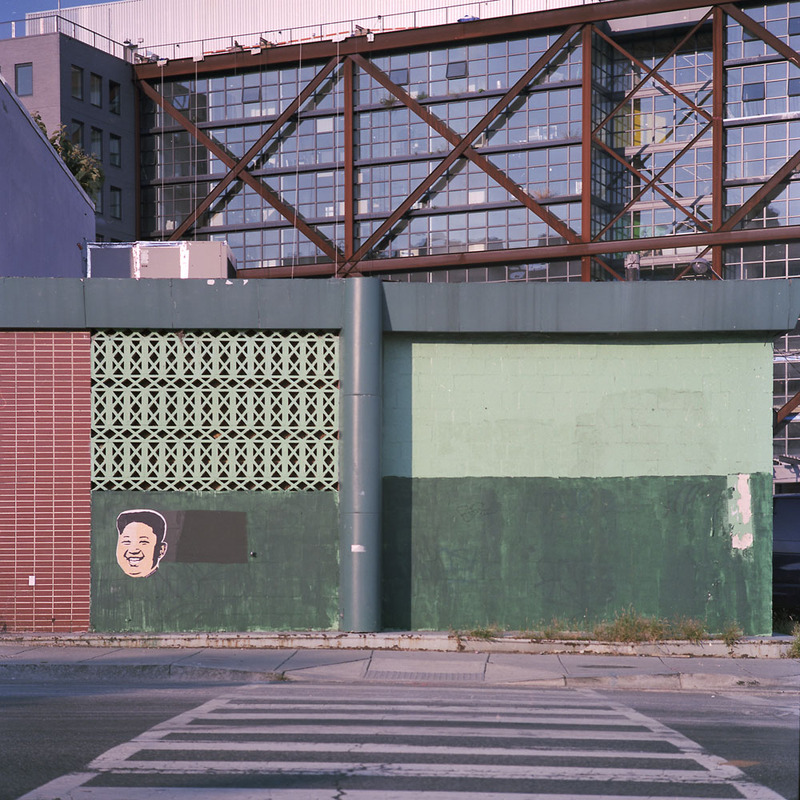 In the big cities, almost everyone speaks it to some degree or other. Signage in museums is in Italian and English – no French, no German, no Spanish, no anything else. Just English and Italian. 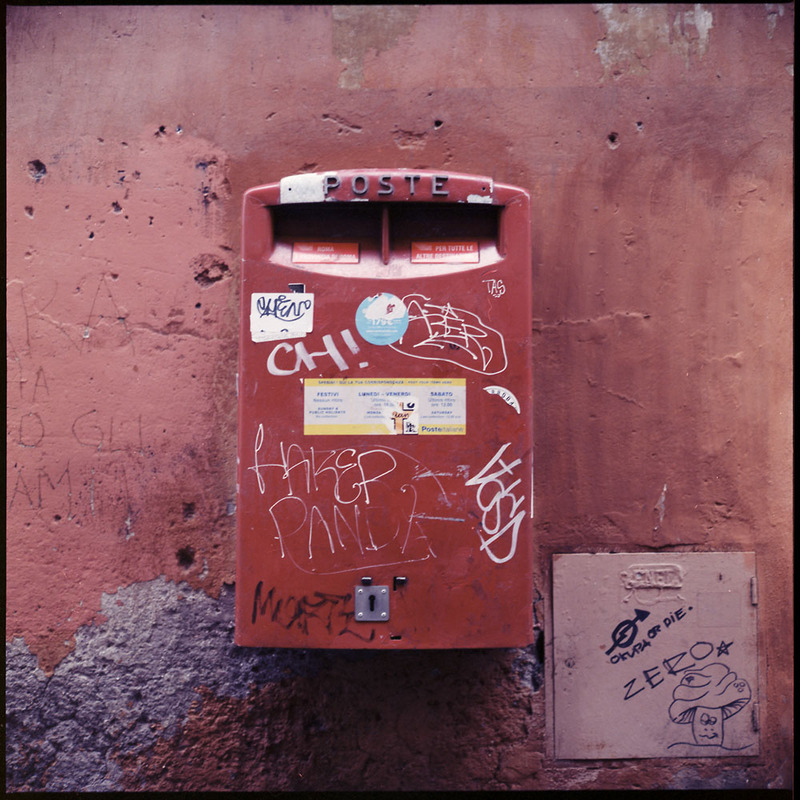 Even the graffiti is often in English, like the little mushroom to the right of the mailbox here, and some obscenities on a wall outside the Garbatella Metro station (forthcoming in a future post). I don’t know what quite to make of it – while it makes life easier for me as a visitor who is not proficient in Italian (I can fake it ’til I make it based on my fluency in Spanish), I do worry about global homogenization. The Colosseum is truly one of the marvels of ancient Rome. A building that could seat somewhere between 50,000 and 80,000 (the higher number comes from an ancient source – modern estimates are lower) but evacuate them all in just minutes, hosted mock sea battles, and was designed and constructed without the use of decimals or precision measurement systems. 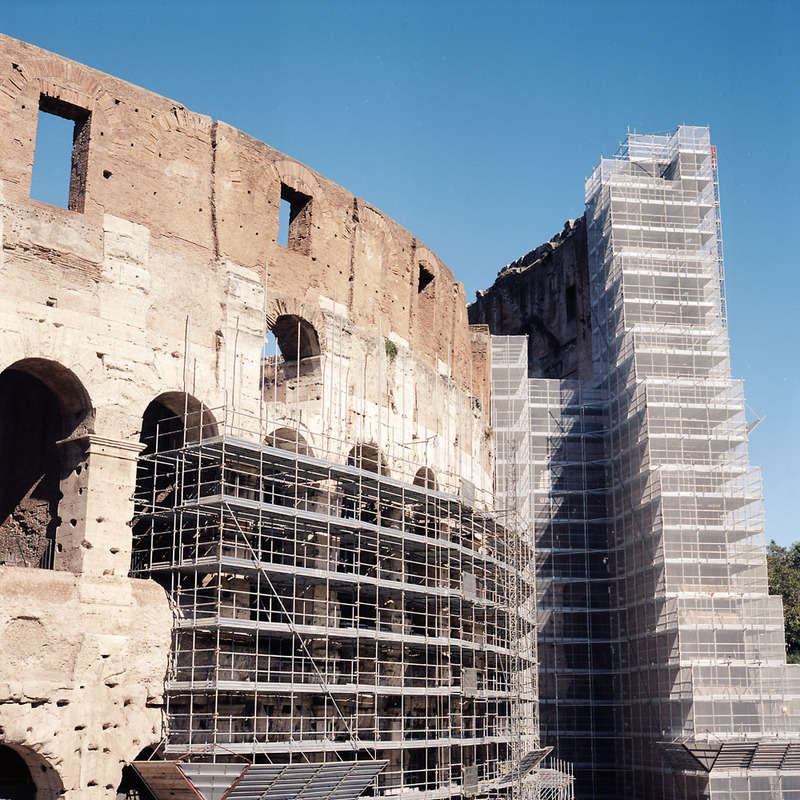 There is an ongoing project to restore and stabilize the outer wall of the Colosseum. To that end, they’ve wrapped parts of the exterior in scaffolding to assist in the work. 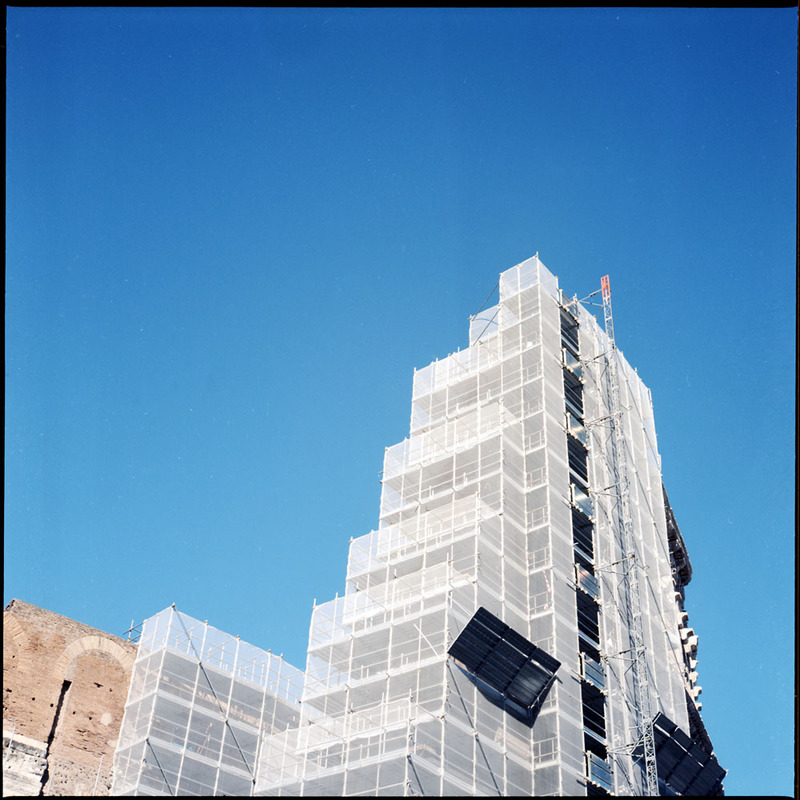 Viewed from a different angle, the scaffold takes on the appearance of a modern skyscraper. 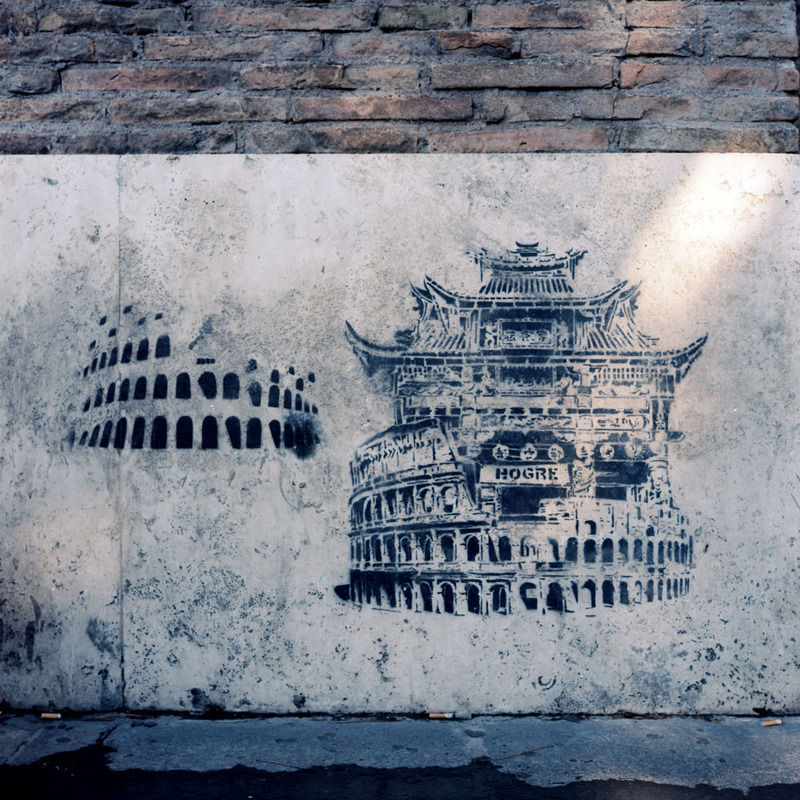 I spotted this bit of graffiti on a wall outside the entrance to the Colosseo Metro station. 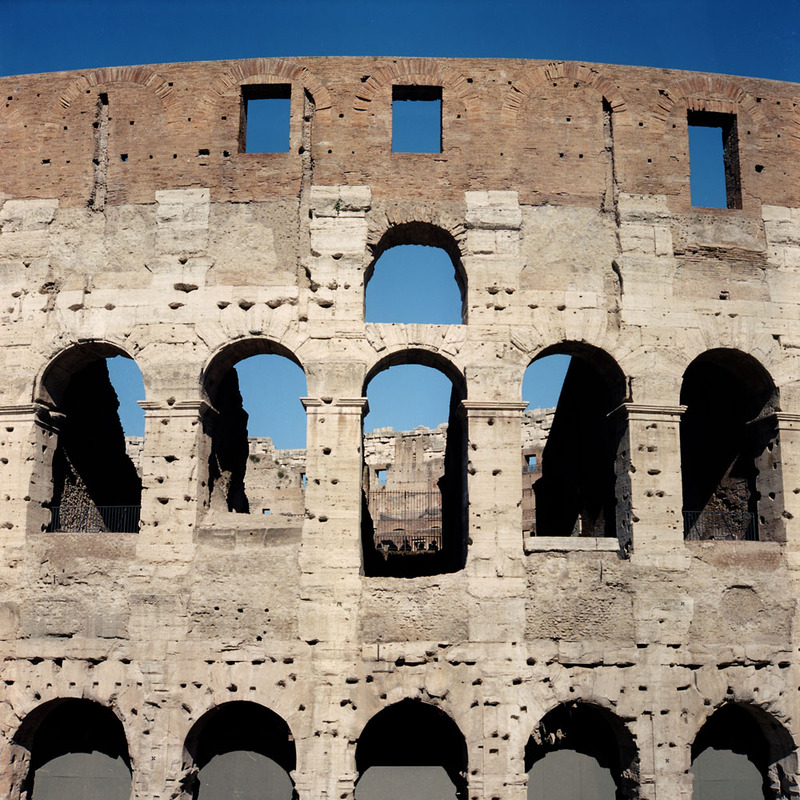 A simple shot of the Colosseum exterior wall in a section not undergoing stabilization work. You’ll notice I have no shots of the interior of the Colosseum. I did not make it inside. 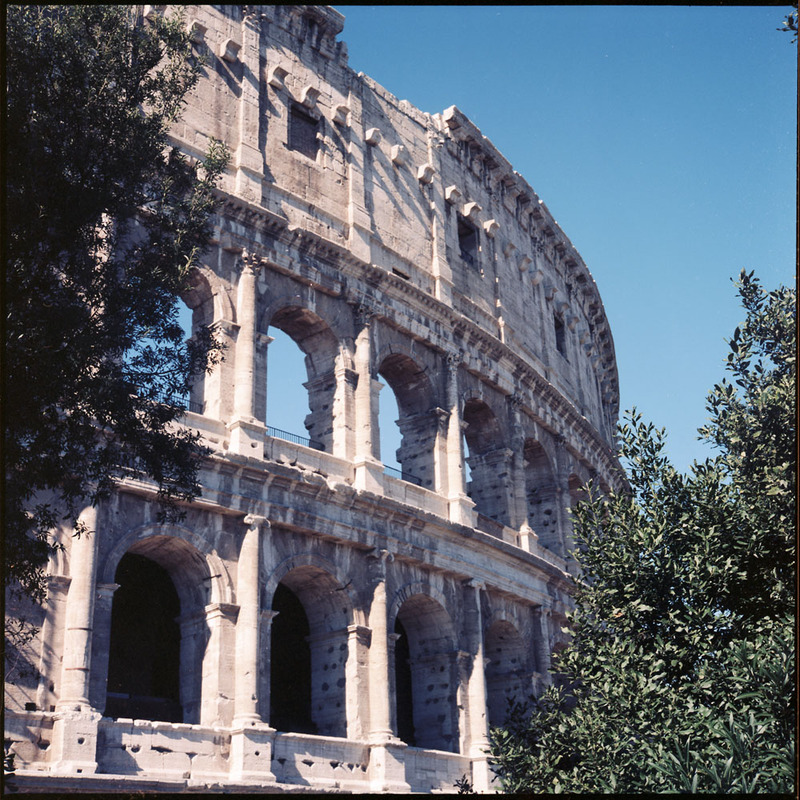 Traveler’s tip – if you want to see it without booking a tour, you need to buy a timed entry ticket, which you can get from the ticket booth at the entrance to the Forum. Get the ticket from the Forum (it lets you in to both the Forum and the Colosseum) instead of trying to get it directly from the Colosseum. Why? Because the line to get in, EVEN if you have the RomaPass card, is about 2-3 hours long. There will be lots of touts outside the Colosseum offering tours that will let you skip the line to get inside. 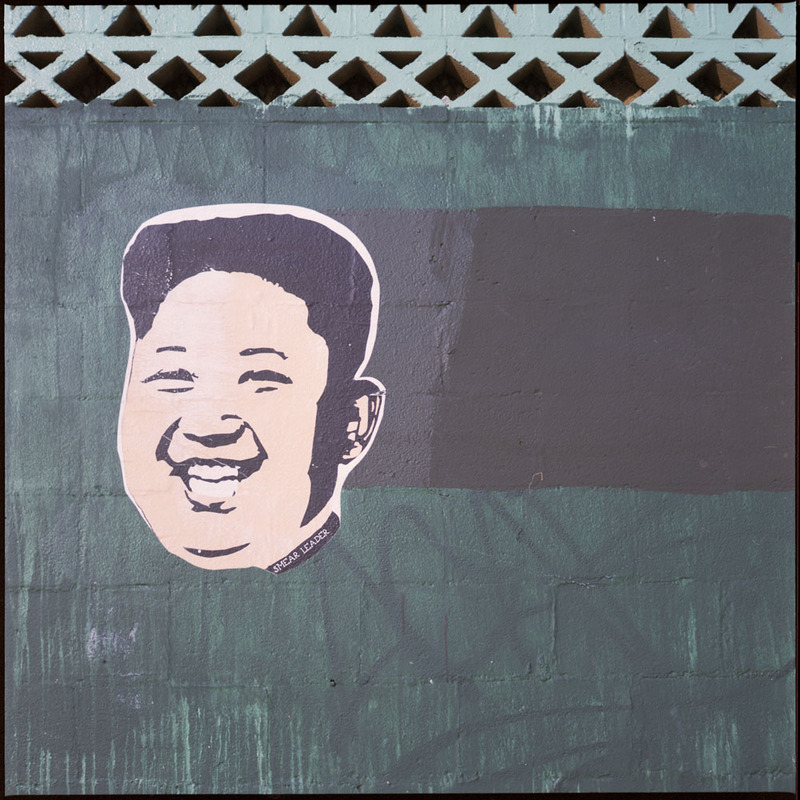 Most of these will have the sole value of letting you skip the line – the guides are of varying and often poor quality. You’re better off pre-booking your tour in advance through an agency with online reviews that you can tell how good a program they offer. The advantage of a pre-booked tour is that the tour guides will be able to take you in to parts of the Colosseum you can’t enter if you just go in yourself. 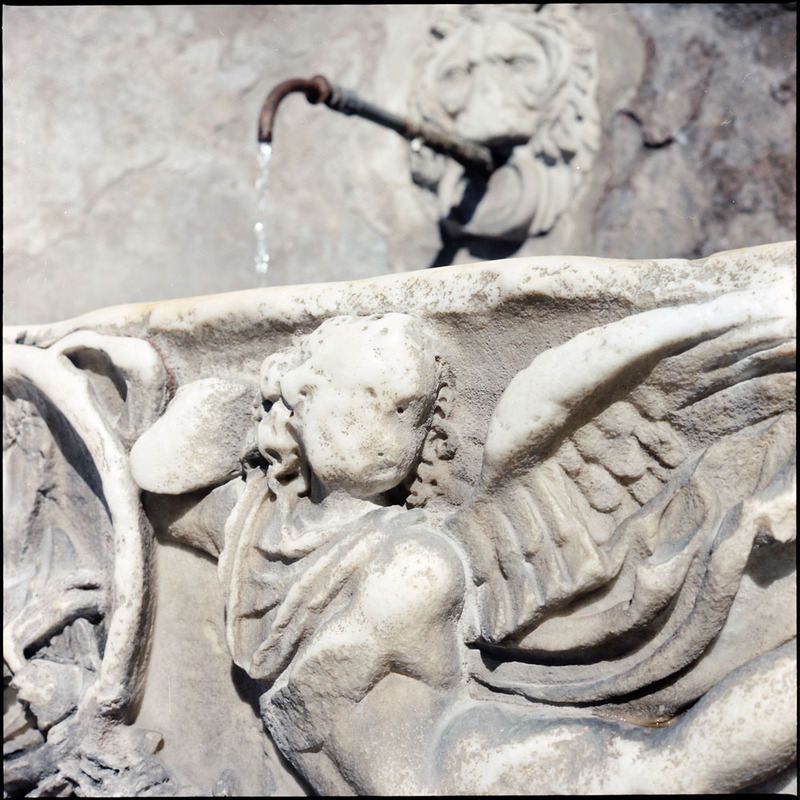 You’ll find public drinking fountains all over Rome. It’s one of the charming features of the city. Unlike fountains in some cities, they run continuously. You can fill a cup or a kettle from the spigot, or if you just want a sip, you can put your finger under the water spout to block it and water will squirt up from a small hole in the top of the pipe so you don’t have to hang upside down to get your water fix. That’s a try-at-your-own-risk activity though – if the water pressure on the spout you’re blocking is good, it comes out the little hole with quite some velocity – I tried it on this fountain and got a thorough squirting in the face. Given the heat of the day it was a welcome squirt, but not expected. I don’t know how old the trough under the spigot is, but it appears to be of the late Imperial era. 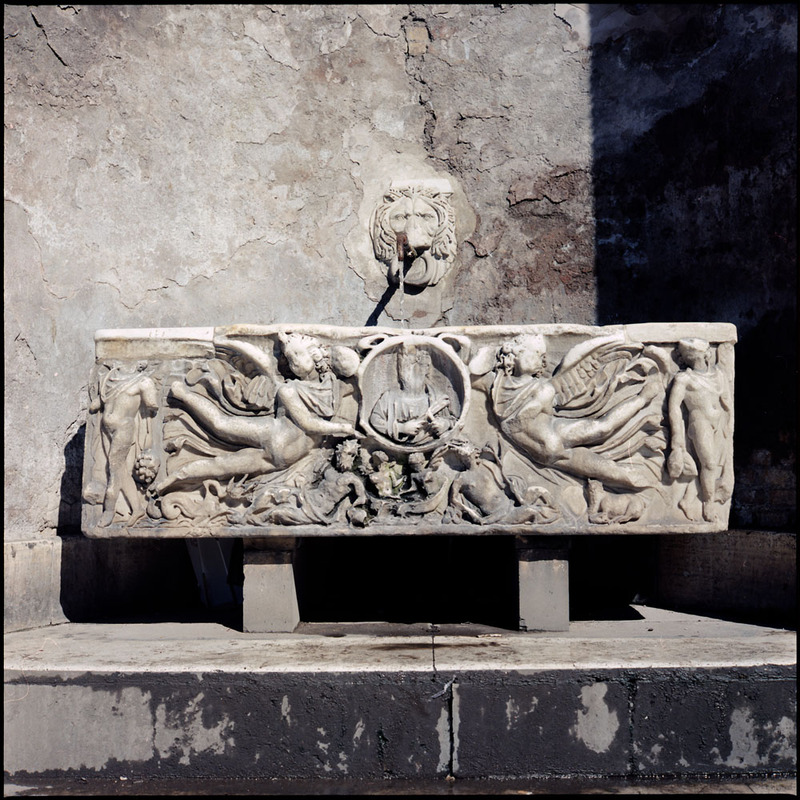 It may have always been a water trough, or it may have been a sarcophagus – it’s the right size for it. 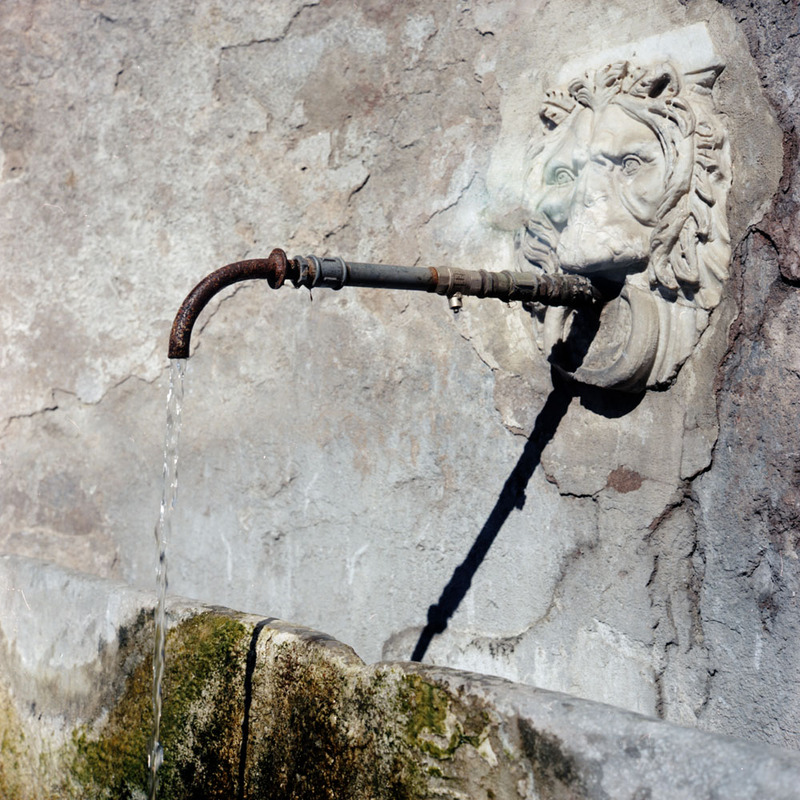 But probably only in Rome will you be able to drink your water in a 1700 year old water fountain. A detail of the carvings on the fountain. 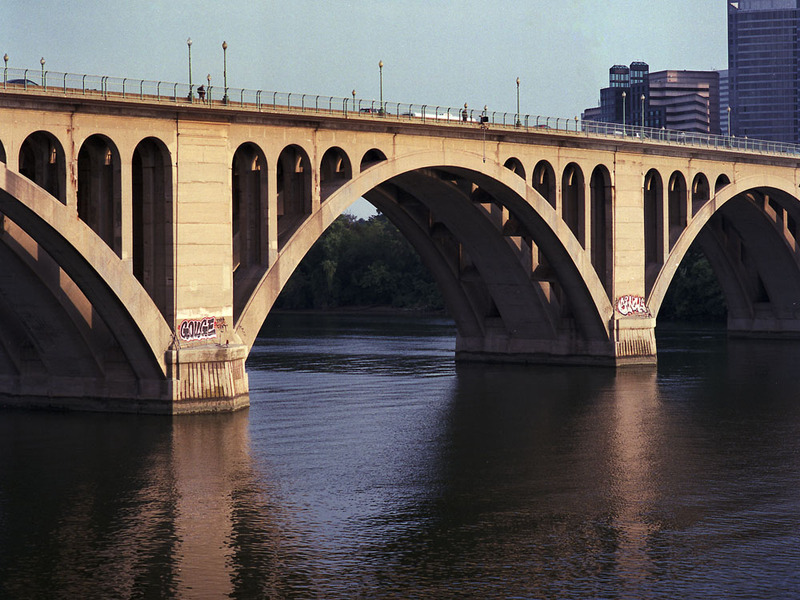 Key Bridge is one of the most iconic structures in Washington DC and a major attraction in its own right. It spans the Potomac between Georgetown and Rosslyn, and carries a tremendous volume of traffic between DC and Virginia every day. The view of the underside is one most people never get, of this or any bridge for that matter. 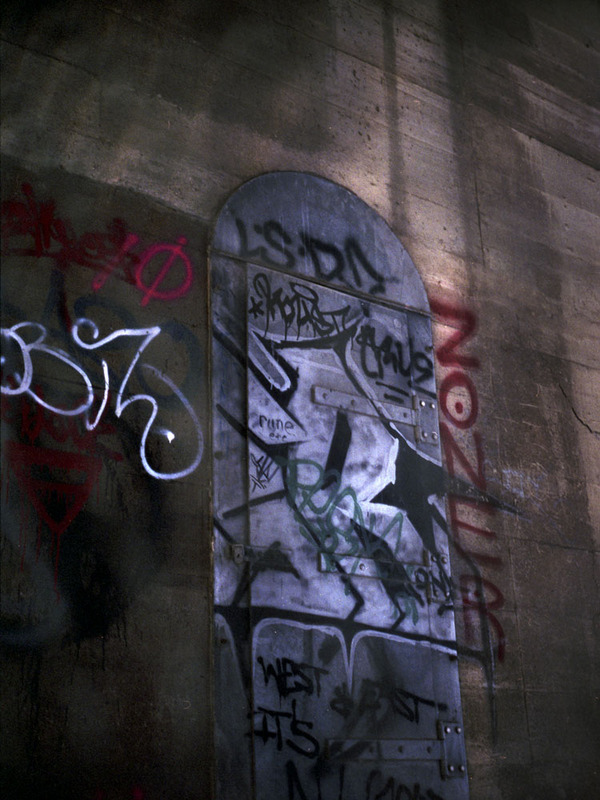 Key Bridge is chock full of strange hidden nooks, like this service door to something in the infrastructure. Despite being sealed off behind chain-link fencing, people have managed to get in and graffiti it. 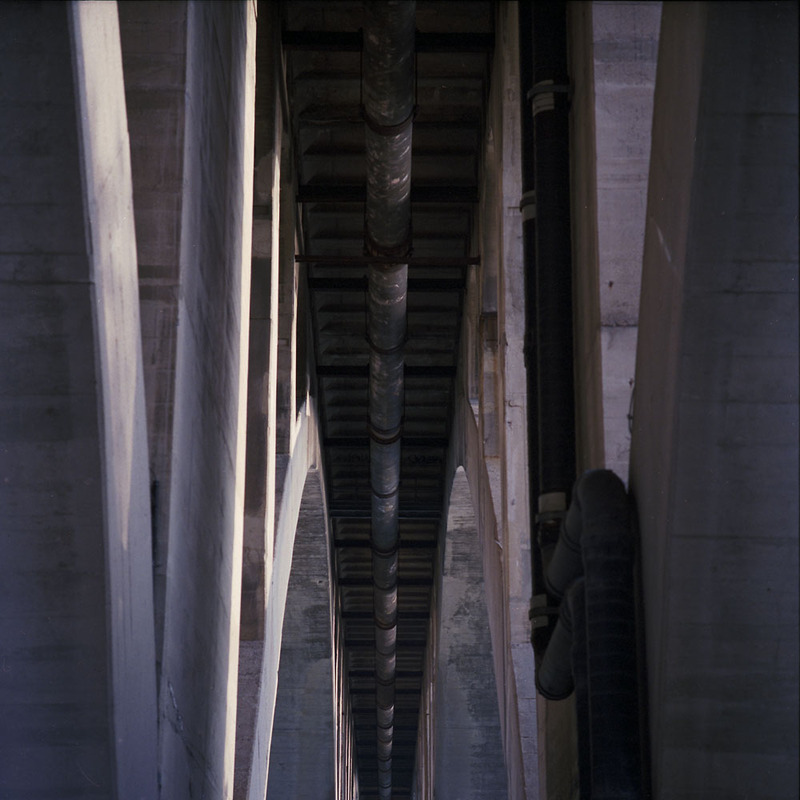 The prototypical view of Key Bridge, from the West side. I’m fascinated by how someone managed to get to the bottoms of the piers and graffiti them. You’d have to either have a boat, sail up to the foot of the pier, then climb up 20+ feet from the waterline, or somehow rappel down from the pedestrian deck of the bridge. Not a recipe for success on either front, as I’d imagine you’d be spotted very quickly and arrested. 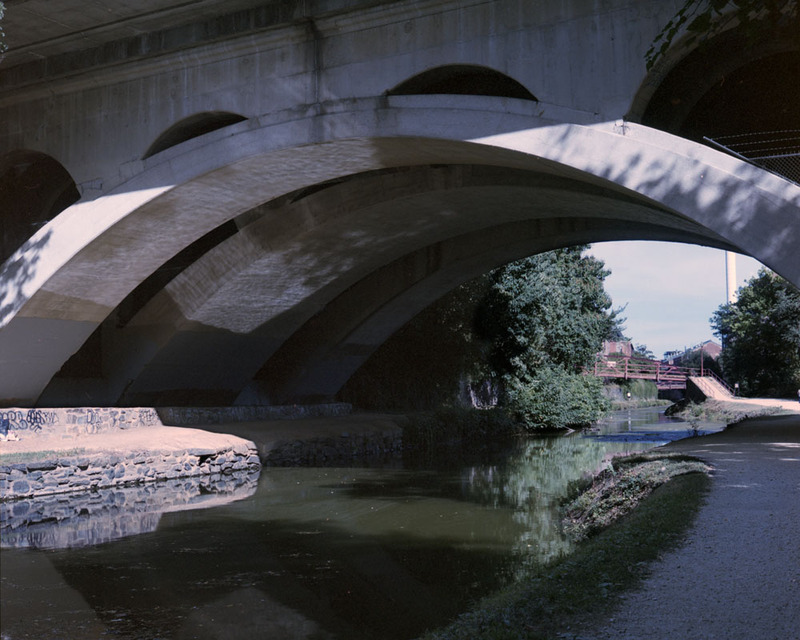 Here’s a view of the underside where the bridge crosses the C&O Canal. This is the tower of the old Trolley Barn, which used to house the streetcars that plied DC in the late 19th/early 20th century. Now it is office space on the upper levels. 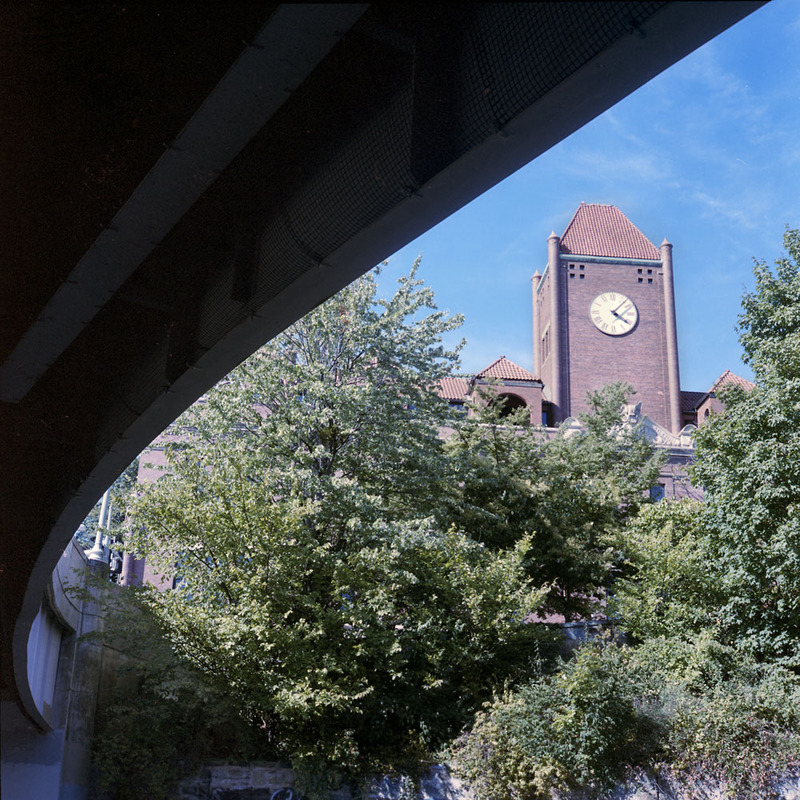 The view is from under Key Bridge, where the on-ramp to the Whitehurst Freeway (really just an elevated bypass to get around the street traffic of Georgetown) splits off of Key Bridge.